Did you ever hear the one about the freakbeat band who pretended to be another band on record and it became a hit and they refused to be part of the charade? This my friends was the story of famous British freakbeat act The Fleur De Ly's who cut both sides of this 45 under the moniker of Rupert's People for a cat named Howard Conder. When the record began creeping up the charts he had to hastily assemble a troupe of musicians to put on the road and telly to promote after the Fleur De Ly's told him to stuff it. Interestingly enough the band backed Sharon Tandy on a version of "Hold On" which was released the same month (July 1967) as this (see http://anorakthing.blogspot.com/2011/03/sharon-tandy.html ). "Reflections of Charles Brown" follows in that grand British 60's pop-sike tradition set into motion by Procol Harum of nicking Bach for pop purposes. After it's Bach inspired organ intro the number is rather slow and moody with some soulful vocals and easily the kind of track you can collapse into a heap to hear on the sofa at the end of an exhausting day's work/parenting. I didn't like it for ages upon ages and only really grew to appreciate it years ago laying on my couch out of my head and hearing it, needless to say I'm a changed man now. 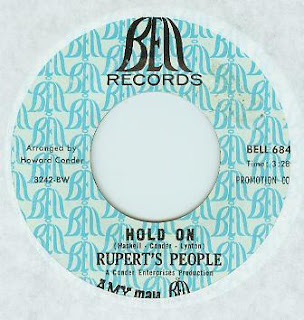 The flipside, "Hold On" as mentioned above is a rocking affair. Whereas the Sharon Tandy version is exclusively propelled by a blistering guitar, this version is as well but is also accompanied by a distinctive groovy mid 60's mod organ, imagine "Bert's Apple Crumble" by the Quik if it had some distorted guitar on it trading licks with the B-3! There was another U.S. issue bearing the same matrix number but had a dark blue label embossed into the vinyl with silver lettering as well as double sided promo copies of "Charles Brown". Promo copies also appeared in white with light blue lettering (as above) or pink. I guess Bell had big plans for this record here! Needless to say it never charted and was, at least back in the mid/late 90's to be had everywhere, much like The Bat's "Listen To My Heart" and Los Bravos "Going Nowhere" which every U.S. mod/DJ I knew had at least 1 or more copies of ! Both tracks, especially the "A" side have seen a multitude of compilation reissue action but you can find both tracks on the Fleur De Ly's CD compilation "Reflections". Awesome song, a great dancer too! Flower Power grows in Mud!